As of 1041 this morning, Eastern Time, I have officially taken over control of this board. Mr. Ottens is. . . no longer with us, shall we say. He's decided to take an . . . indefinite leave of absence. As such, this forum will be held under a much tighter fist. Any sort of spam or one-line posting will be instantly deleted and the user banned. Further, all forum participants are limited to one post per hour. I will soon be banning someone as an example to others. Oh, and one last thing: You will all refer to me as "Your Royal and Supreme Highness." I did wonder why all the windows had been blacked out! That was a one line post, Your Royal and Supreme Highness! ...and mine definitely isn't. Please don't ban me, I am only your humble servant. Ha! The hell with this Diktatorship, I say! I stage a COUP. Who is with me? 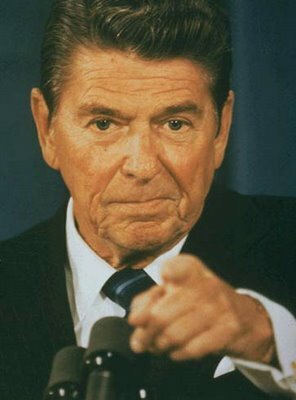 JOIN the REAGANITES, today! Oh, and YOU, Mr Roger, have been declared an EXPELLEE. It is time for you, to DEPART! It is YOU who has caused a worldwide economic downturn. DEPART. The Head of Ronald Reagan has been BANNED. Banned? Me?! I don't think so! WHAT HAVE YOU DONE TO MY PARTY? Silly faces will get you no where, Reagan. Yeah like bombast gibberish like that little speech of yours is hitting it. Remember, I saved the GOP, not that robot arm of yours. Now put that in your pipe and smoke it. Pinhead.